Along with a full complement of the trendsetting style elements featured in the current PowerShot lineup, the new models add a dash of technical advancements including Optical Image Stabilization (OIS), Face Detection technology, in-camera Red-eye Correction and 8.0-megapixel resolution. "The PowerShot S5 IS digital camera meets the demands of active family photographers and discerning photo hobbyists looking for high-end features and maximum photo flexibility, while maintaining the light weight, trim profile and affordability of a point and shoot digital camera," said Yuichi Ishizuka, senior vice president and general manager, Consumer Imaging Group, Canon U.S.A. "With a broad range of features and a powerful ultra-zoom lens, it is no coincidence that the PowerShot S5 IS digital camera's look and feel evokes the sense of a small, lightweight SLR." The PowerShot SD850 IS Digital ELPH camera also has an array of top-tier photo features including an advanced ultra-compact zoom lens and optical viewfinder to easily capture, record and share images under a full range of shooting conditions, all within a curvaceous, eye-catching compact design. The "brain" of these new PowerShot cameras is DIGIC III, the gold standard on all new Canon digital cameras. The DIGIC III image processor accounts for the camera's higher performance levels, including faster start up, faster autofocus and quicker shutter response times that leave long-lag competitors in the dust. 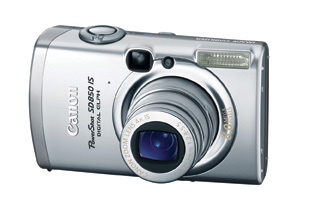 PowerShot S5 IS features fast shutter-speed capabilities - up to 1/3200 sec. and the new accessory Hot-Shoe that accommodates a variety of Canon EX-series Speedlite flashes. 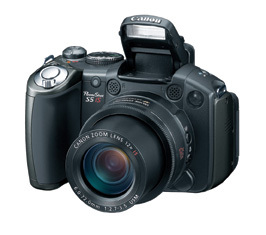 This camera is a technological bridge between Canon's advanced point and shoot compact digital cameras and its entry-level digital SLR cameras. For those seeking still greater optical capabilities, Canon offers an optional 1.5x teleconverter, a .75x wide converter and a close-up lens. PowerShot SD850 IS Digital ELPH camera features six movie modes, including normal and fast frame rates as well as a new Time Lapse movie setting that permits a movie recorded at intervals - the opening of a flower for example - to be condensed into a brief time frame when viewed at the normal 30 frames per second (fps) frame rate. Additionally, the camera's sound recorder can capture audio clips of up to two hours each. Both cameras are Certified for Windows Vista according to Microsoft standards.